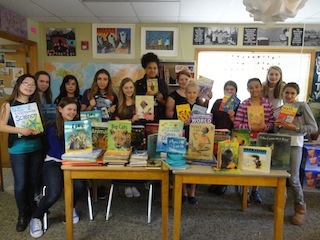 Our SGS read-a-thonnetted $2,000 in pledges and resulted in 158 books we will bring to Rwanda. What is the Seattle Girls’ School Campaign? We are raising money for Richard’s Rwanda so that we can visit and work with our Rwanda sisters this summer. Create a donation page and begin fundraising to help us reach our goal! All donations go to Richard’s Rwanda to help fund a summer trip and support programs.All donors will receive a story and a photo about a life that has been changed through the work of Richard’s Rwanda. This year in the Seattle Girls’ School chapter of Richard’s Rwanda/IMPUHWE we have raised approximately $800. We started off the year with a presentation at our all school meeting to introduce new students to the mission of RR/I. We talked about what Richard’s Rwanda is, what we do, and the genocide that took place along with the effects of it. We encouraged all grades to participate. We raised this money by doing fundraisers such as hot chocolate sales, candy grams, a read-a-thon, and selling snacks at our school dance. The hot chocolate, candy grams, and snack sales were intended to raise money that will continue to provide our Rwandan sisters the opportunity to attend school. The read-a-thon was to send books directly to the girls at the school we help in Nyamata. We encourage you to join this effort by contributing to Richard’s Rwanda/IMPUHWE. We – Asha, Ana, and Taylor – are raising money to take an ambassadorial trip to Rwanda ourselves to meet the girls we are supporting. On the trip we want to give the girls a cross-cultural experience and bond with the girls in Nyamata whose education we Richards Rwanda/IMPUHWE supports. We also want to see and interact with empowered women. We first joined Richards Rwanda/IMPUHWE because we really care about this issue and we wanted to make a change. It’s nice to think that we are helping send girls our age to school. We really want to go on this trip to connect with the girls and get to see what we are doing for our Rwandan sisters. Richard’s Rwanda was founded by Jessica Markowitz when she was eleven years old to support educational opportunities for girls in Rwanda in the rural village of Nyamata. Jessica’s original motivation stemmed from a man named Richard Kananga, a representative from the National Unity and Reconciliation Commission in Rwanda. Richard stayed with her family in the United States, and he recounted many sad tales about the horrendous 1994. With his inspiration, Richard’s Rwanda-IMPUHWE is reaching out to 40 girls to help them achieve an education by supplying them with what they need in order to attend school. Richard’s Rwanda IMPUHWE has established student chapters in several middle and high school across the Unites States working together to support Rwandan girls’ education. We provide financial support to low-income girls in the rural area of Nyamata to enable them to complete their primary education and 6 years of secondary school. Through the completion of their education, we hope to enhance their ability to earn income and become leaders in their community. Eventually, we hope to build a library or learning center for the girls we are supporting and the next generations.